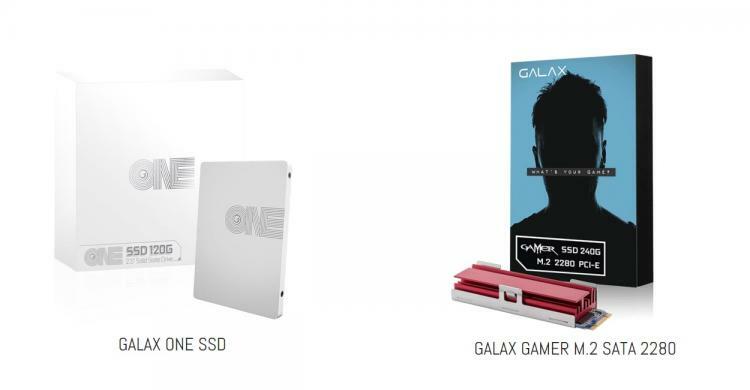 GALAX presents the One Series Solid-State Drive and the GAMER M.2 Series Solid-State Drive. The GALAX One SSD uses SATA III interface and the standard 2.5-inch form factor while the GAMER M.2 SSD uses the single-sided M.2 2280 form factor and PCIe 3.0x2 interface using the NVMe protocol to deliver performance superior to the SATA interface. The GALAX One Series SSD feature Toshiba BiCS3 3D 64Layer TLC NAND Flash and the Phison PS3111-S11 controller delivering a great balance of consistent performance and long-term reliability with excellent energy efficiency. The GALAX One Series SSDs are perfect for both gamers and casual users. The GALAX One SSDs are currently offered in 120GB and 240GB capacities with speeds of up to 520MB/s read and 420MB/s writes also speeds of up to 45MB/s 4K read and 90MB/s 4K write. The GALAX GAMER M.2 SSDs features the Phison PS5008-E8 controller and uses M.2 PCIe 3.0 x2 interface to deliver speeds of up to 1200MB/s read and 800MB/s write. It is offered in 120GB and 240GB capacities. The GALAX GAMER 120-M.2 SSD comes in bare while the GALAX GAMER 240-M.2 SSD sports a red heatsink and Intelligent Temperature Control to prevent overheating. No information on pricing and availability as of this writing.